A recent report has revealed that Mobile application developers say creating apps on Android is faster than any other system. The statistics from Evans Data report that 41 percent of developers think that it's quickest to write apps for the Android mobile operating system, compared with 36 percent for iOS, and 34 percent for Windows Phone. The bulk of that time is spent on testing and debugging processes on all mobile operating systems apart from Firefox OS and Tizen, for which the actual coding takes longest. These figures from the bi-annual Evans Mobile Development Survey might come as a surprise, as time has shown that it is simpler to create universally compatible apps for iOS devices, which have fewer form factors. However, where tablets are concerned, 84 percent of survey respondents claimed they target Android, compared with 62 percent for iOS, with 72 percent claiming that they emulate screen sizes during the testing process. 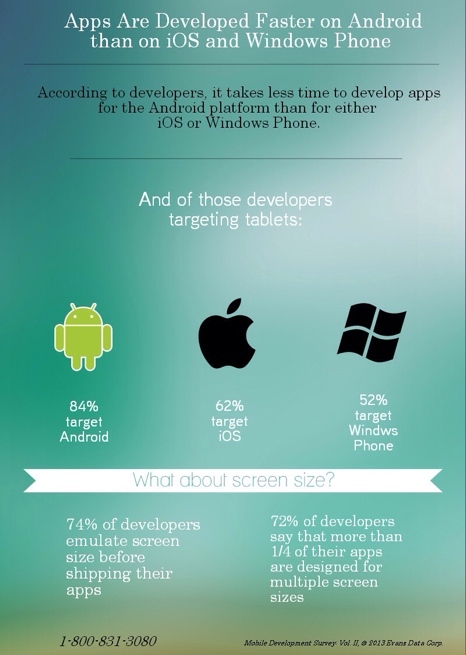 Janel Garvin,the CEO of Evans Data, commented, "Targeting multiple screen sizes is definitely the way to go. The benefit of having your app run across the gamut of device types is obvious, and while there are difficulties in synchronization across device types, and in the range of graphics capabilities that are supported by different screens, the benefits still outweigh the effort." ZAPTEST offers testers just as much flexibility with testing mobile applications on Android. ZUMA (ZAP Universal Mobile Access) for Android is a technology that provides the ability to remotely control Android devices and execute functional tests against any Android application without rooting or instrumenting it, while allowing WIFI and USB connectivity to the device. The installation process is extremely simple and user-friendly: connect the device through USB to the PC and run the installer. ZUMA for Android supports all the latest Android devices and operating systems. To learn more about how ZUMA can expedite your testing and to evaluate this market-leading tool for free, you can visit our website at www.ZAPTEST.com.